A Bristol man has been fined £500 after admitting fly tipping waste at a service station in Emersons Green, and a Longwell Green man has been ordered to carry out unpaid work and pay £210 in costs after he admitted fly tipping waste in Wick. James Meade, 36, of Portland Street, Soundwell, Bristol, appeared before Northavon Magistrates’ Court on Friday 5 June. He pleaded guilty to knowingly causing waste to be dumped and was fined £500 with £500 costs and was also ordered to pay a victim surcharge of £50. The offence took place at The Black Horse Service Station on the Westerleigh Rd in Emersons Green, South Gloucestershire. The court heard how on the morning of Wednesday 11 February the garage and forecourt areas were tidy and in order, but early in the afternoon the manager noticed something suspicious in the forecourt area by the air and water pumps. When he inspected this area he found that an area of ground covered in brick and concrete dust and assorted nails and screws. He also discovered a large amount of waste consisting of polystyrene sheeting, brick, wood, and food wrappers beside a nearby litter bin. No attempt had been made to place the waste in the bin, and the waste on the forecourt was dangerous to both the tyres of vehicles and to pedestrians. The manager arranged the immediate removal of the waste and examined the CCTV footage, where he saw a Vauxhall Vivero drive onto the garage forecourt and park facing the air pump. After visiting the shop, two men were seen to open the rear doors of the van and take out a wheelbarrow which they proceed to load up and push towards the area of the air pump. Plastic sheeting could be seen being pulled out of the van, bundled up and carried towards the air pump area. The waste was pushed from the van onto the service station forecourt. A wheelbarrow was emptied on to the floor and no attempt was made to clear the spillage. The matter was then reported to the Police and South Gloucestershire Council and copies of the CCTV footage were forwarded to them. The registered keeper was traced to his current address in Soundwell, Bristol and officers from South Gloucestershire Council and Avon and Somerset Police visited the address, noticing that the same Vauxhall Vivero van was parked outside. Meade answered the door, confirming his identity and that he was the owner of the van parked outside. He was told that occupants of his van had been seen fly tipping at the Blackhorse Service Station on Wednesday 11 February. He stated that he could not remember who was driving his van on that day and would have to consult his records. He was then handed a letter requesting he attend an interview at the council’s offices and was also presented with a Section 108 Notice requiring him to name the driver of the van at the time of the offence, as well as a requirement to produce a Registered Waste Carriers Licence and a Waste Transfer Note. No documentation or contact in reply to the letters and Notice was received by the council and no one attended for interview. Appearing before North Avon Magistrates’ Court on Friday 5 June, Meade pleaded guilty to knowingly causing the waste to be dumped and the section 108 offence which required him to name the vehicle’s driver. He was fined £500 with a further £500 costs and was ordered to pay a victim surcharge of £50. John Webber, 31, of Pearsall Way, Longwell Green, appeared before Northavon Magistrates’ Court on Friday 5 June. He pleaded guilty to fly tipping and was ordered to carry out 100 hours of unpaid work and pay the council’s clear up costs of £110, along with another £100 towards prosecution costs. 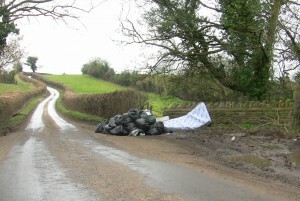 The fly-tip took place on 7 March at Oldbury Lane in Wick. The court heard how a significant amount of waste had accumulated at an address in Long Beach Road, Longwell Green, which included mattresses, furniture, wood and at least 10 black bin liners containing household waste. Following complaints from neighbours the resident was desperate to have it removed. Mr John Webber, a friend of the householder, worked as a parcel delivery driver and offered to take the waste away for free. On the evening of Saturday 7 March he arrived at address with his delivery van, loaded the waste and took it away. Following a tip off, the council’s environmental enforcement officers visited Oldbury Lane on 9 March where they took a series of photographs of fly tipped waste and found documents relating to the address in Long Beach Road. The officers attended the address and spoke with the householder who recognised the waste as that taken away by the defendant two days previously. Webber voluntarily attended the council offices where he was interviewed under caution. He fully admitted the offence of fly tipping and identified the waste and its location from the photographs of the fly tip. Webber explained that he had gone to Long Beach Rd after working all day since 5am. His original intention had been to take the waste to the local Sort It centre in Mangotsfield, however he realised that it would be closed. His parcel delivery van was loaded with dirty and smelly waste that he didn’t want to leave it in his work van overnight. He knew of Oldbury Lane as a remote and infrequently used road and went there that evening and dumped the waste out of the van. He admitted that he knew he should have unloaded the van then reloaded it and gone to the Sort It centre the following day, but he was so tired after a long day the he decided to get rid of it as soon as possible. In court, Webber pleaded guilty to illegally dumping the waste. He was ordered to do 100 hours unpaid work and pay the council’s clear up costs of £110 and a further £100 towards the costs of bringing the prosecution. South Gloucestershire Council’s Communities Committee Chair Cllr Heather Goddard said: “These cases serve as a reminder that if you are involved in the illegal dumping of waste in South Gloucestershire, you will be prosecuted. We have already had four successful prosecutions this year, and further cases are being prepared. Residents are advised to only give their rubbish to an Environment Agency registered waste carrier or they could be held liable if waste is subsequently fly tipped. • Ask for a copy of the company’s waste carrier registration certificate and ask where the waste is being taken. Legitimate firms will be happy to provide this information. Do not be tempted to use people offering cheap waste clearance on sites such as Facebook and Gumtree unless you have confirmed they are registered. Unwanted goods and household or garden waste can all be disposed of at no cost via the council’s Sort IT! * centres.